The Britten-Norman BN-2A Islander is a twin-engine high-wing light utility transport aircraft for up to nine passengers. Britten-Norman Ltd. started in 1963 with the development of the BN-2, a 10 seat STOL aircraft. The prototype BN-2, G-ATCT s/n 01, flew on 13 June 1965, powered by two 210 hp Lycoming IO-360 engines. A production line for the BN-2 was set up at the Britten-Norman factory at Bembridge, Isle of Wight. The first production BN-2 Islander, G-ATWU s/n 2, flew on 20 August 1966. Deliveries of the production model started on 13 August 1967, after UK CAA certification was awarded on 10 August 1967. The first production BN-2 Islanders were powered by two 260 hp Lycoming IO-540 engines. By 1968, demand for the Islander had outstripped the capacity of the Bembridge factory. A contract was signed with the Romanian IRMA to build "green" Islanders and deliver them to the UK for finishing. The BN-2 Islander was developed further and in 1970, the BN-2 was replaced in production by the improved BN-2A Islander. Despite the succes of the Islander, Britten Norman was in grave financial difficulty by the end of 1970. In October 1971, the new company Britten-Norman (Bembridge) Ltd. was set up. In August 1972, Britten-Norman (Bembridge) Ltd was sold to the Fairey Group and a new holding company, Fairey Britten Norman Ltd. was established. Most of the Islander and Trilander production was moved to the Fairey S.A. factory in Gosselies, Belgium. Islanders and Trislanders were produced in Romania, then shipped to Gosselies in Belgium for finishing and later flow to Bembridge in the UK for the final flight certification. In 1977, the Fairey Group went in deep financial difficulties. As a result, production slowed down and Britten-Norman got a new owner and became Pilatus Britten Norman Ltd. in July 1978. Production of the Islanders returned to Bembridge. In July 1998, the company was renamed Britten-Norman Ltd., and from May 2000 it became part of the B-N Group Limited. Over 1250 BN-2 aircraft are delivered since 1967, including production in the UK and Romania and military Defenders. On 31 January 1995, the Britten-Norman BN-2B-20 Islander c/n 2290 was registered G-BVXY in the UK with Pilatus Britten Norman Ltd., Bembridge, Isle of Wight. On 5 June 1996, registration G-BVXY was cancelled as exported to Germany. On 7 June 1996, the 1995-built Britten-Norman BN-2B-20 Islander was registered D-IFKU in Germany with FLN - Frisia-Luftverkehr Norddeich (Norddeich). The airliner operated charter flights and scheduled flights out of Flugplatz Norddeich near Norden to and from the East Frisian Islands. On 1 April 2011, FLN Frisia-Luftverkehr Norddeich acquired LFH Luftverkehr Friesland Harle, but continued to use its own branding. From 1 November 2014, LFH Luftverkehr Friesland Harle (Carolinensiel) and parent Frisia-Luftverkehr Norddeich (Norddeich) merged into a single company under the banner FLN - Die Inselflieger (Norddeich). Today, FLN - Die Inselflieger is operating charter flights and scheduled services from Norden and Harle to the German islands of Baltrum, Borkum, Föhr, Helgoland, Juist, Langeoog, Norderney, Wangerooge. 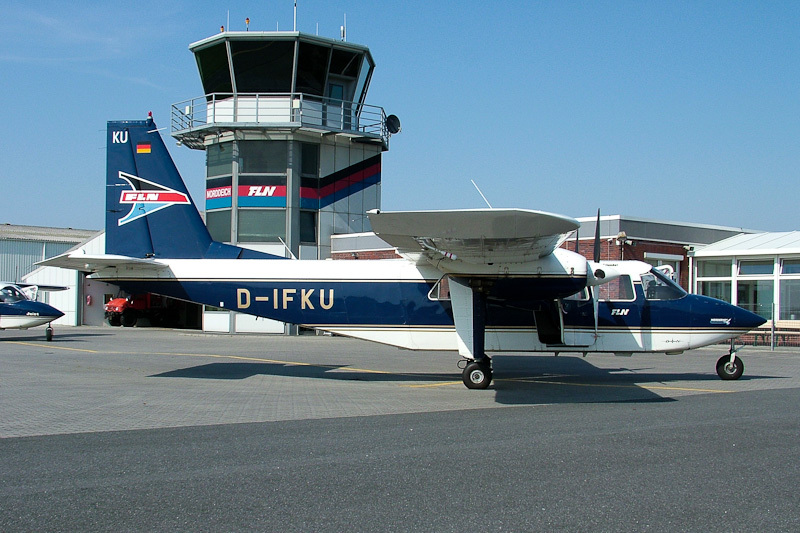 On 5 May 2006, the Britten-Norman BN-2B-20 Islander D-IFKU "Norderney" was seen at Flugplatz Norddeich waiting for pax for the next scheduled service.